There are many aspects of the manufacturing process that not many people know about or pay attention to. However, despite their relative obscurity, these remain a crucial factor in how well the final manufactured product turns out. One of these aspects is accurate material dispensing. Accurate material dispensing is just what it sounds like: the dispensing or allotment of material in an accurate manner, according to a dictated amount. In the context of manufacturing, it’s the act of dispensing raw materials and/or ingredients in the creation of a consumer product, with the amount of materials or ingredients matching exactly what is called for, as stated by a regulatory or safety body and the product’s own manufacturing standards – no more, and no less. There are many ways for manufacturing lines to achieve accurate material dispensing, one of which is the integration of automated technologies such as high-precision linear stages. By automating material allotment, the number one source of errors in a production line – human error – may be taken out of the equation, which therefore results in more accurate results and an overall better product. Why is Accurate Material Dispensing Important? Many manufactured products today are made up of various ingredients, both raw and synthetic, which have to be doled out in exact amounts. This is especially true when it comes to consumable products and those applied to the human body, such as food and drinks, medicines, hygiene products, and cosmetics. A deviation in the dispensing of any of the ingredients during the manufacturing process could result in a flawed output. These flaws in the final product may present itself in various ways, and depending on the product itself,the item could still be considered a usable product. However, in the realm of consumable items, even the slightest deviation in material dispensing could result in a product that could be unpleasant or downright dangerous to the consumer. A food product, for example, could have an “off” taste or a bad smell.Worse, the flawed product may cause adverse side effects like allergic reactions, food poisoning, or even death. Obviously, all these scenarios can damage a company’s reputation, not to mention result in revenue losses. 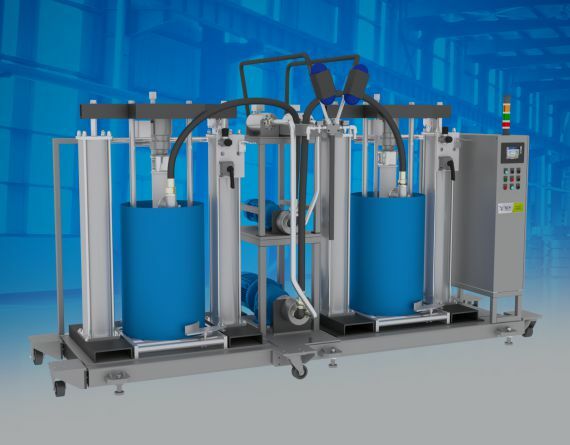 It’s in the manufacturing industry’s best interests, therefore, that the material dispensing aspect in their production lines are as accurate as possible. This ensures not just high-quality products but also a consistent positive image of the company. Which products and industries benefit the most from accurate material dispensing? Any formulation of medicines, whether they be tablets, pills, capsules, or syrups, need to be produced accurately, as any deviations in their chemical compound makeup could result in low or non-effectiveness, adverse side effects, and health complications. This is especially true with consumers who are taking regularly taking “maintenance” medication for chronic health conditions. Food P A deviation in the dispensing of ingredients when it comes to food products could result in the products having different, or even unpleasant flavors or odors. Some ingredients also lead to toxicity and other undesirable side effects to the human body when ingested higher amounts, so manufacturers should be extra careful in dispensing these materials. Accurate material dispensing is needed in the realm of cosmetics as they are applied topically to the body. A deviation in the specified ingredient allocation could result in the wrong shade, smell, and/or consistency, as well as allergic reactions and other negative side effects. While material dispensing may only be a single part in a multifaceted manufacturing process, it could be argued that it is the most important one. Achieving accurate material dispensing in manufacturing lines means producing high-quality commercial goods that are safe for use, not to mention providing a smoother, easier, and safer experience in the workplace.